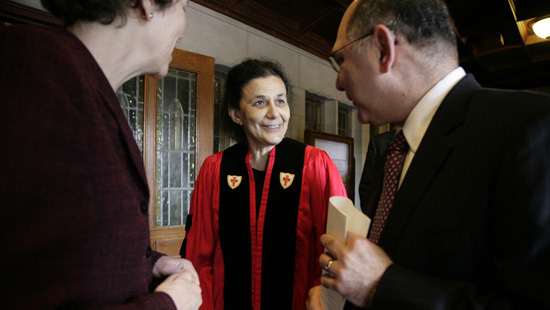 Boston University's Baccalaureate service this year featured the researcher, physician and AIDS activist Wafaa El-Sadr. A graduate of the University of Cairo, Dr. El-Sadr is the director of the International Center for AIDS Care and Treatment Centers, is a Fellow of the John D. and Catherine T. MacArthur Fellow and a leader in the Columbia University's Mailman School of Public Health. When she first started her work on addressing AIDS in Africa, she was ridiculed and admonished for setting her sites on such an expense and obviously "doomed" endeavor. Today, the result of her work has saved millions of lives in sub-Saharan Africa and has led to the opening of a comprehensive HIV Treatment program at New York City's Harlem Hospital Center. This is an important message and reflection for leaders of any organization or group. "Fear of Failure" is one of the greatest inhibitors to not only innovation, but to the act of execution itself. When leaders are afraid of making mistakes, they protect the status quo under the impression that staying the same is safer than doing something different. As we have seen in the past few months, defending the status quo is not always the safe strategy. Even if you don't have a Fear of Failure culture, you may have followers who are afraid of taking risks. Most people are not truly afraid that if they make a mistake they will get fired. Most are afraid that if they fail they will be humiliated or embarrassed. Failure itself is inevitable at times and most people know that. For a leader to create a culture of innovation and decision-making, he or she has to adopt a set of behaviors that critically examines the cause of failure while at the same time validates the people who are involved. Fear of failure can easily be fear of blame and it is within the power of leaders to establish a culture free of blame. By looking at not only at the results but at the context, process and intent, leaders can avoid creating the culture of 'no' that inhibits true creativity and innovation.